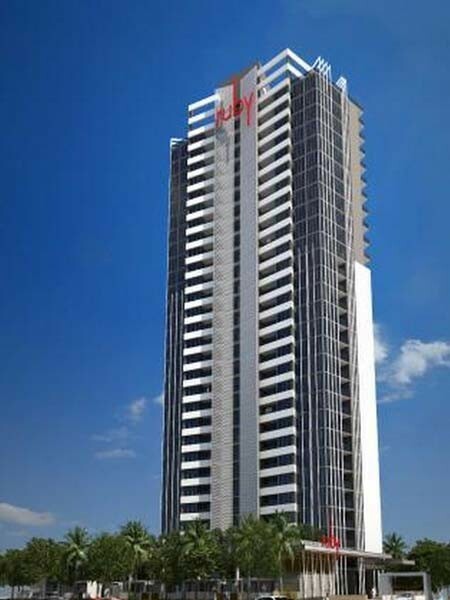 Designed by architect DBI Design, Ruby Apartments is one of four high-rises planned for the site. The apartment building, being built as part of Stage 1, will be a striking addition to the city’s skyline and is expected to create a new urban focus for the Budd’s Beach community. Working closely with glazing contractor, Hitec Glazing and balustrade contractor, Feenix Balustrades, Architectural Glass & Cladding will supply a range of architectural glass products for the exterior glazing of the building, using their vast supply chain to access an unlimited range of glass products. This, together with their exceptional customer service levels, makes AG&C one of the leading architectural glass suppliers for landmark projects throughout Australia and South East Asia. Architectural Glass & Cladding will supply Tinted Grey Heat Treated and Laminated Glass, Low E Laminates and Spandrel Glass, and Toughened and Heat Soaked Clear and Grey Balustrades Glass, totally covering an area of approximately 9,000 square metres.